Samuel Sales Saraiva is the author of projects, studies and proposals focused on social services and environmental preservation. 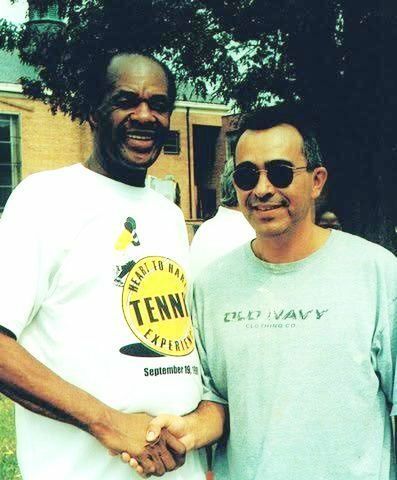 He was accredited by the New York State Police (NYPD) in 1992, and has worked as a journalist affiliated with the National Press Club (NPB) and the National Association of Hispanic Journalists (NAHJ) in Washington, D.C. The son of Lt. Jairo de Freitas Saraiva (veteran of World War II) and dentist Adamar de Paiva Sales Saraiva, Samuel was born in Porto Velho, capital of the Brazilian Territory of Rondonia, in the early 60s, a golden era for the Brazilian Amazon. In those times, the springs and tropical forests had not yet suffered the devastating and senseless criminal abuse that is currently evident. He walked under the damp dawns of childhood on the rails of the legendary Rail track Madeira Mamore- EFMM, listening to the chimes the oldest existing clock tower of the Central Building which is evidence of the origins of the city built by US entrepreneurs, served by crowds of Caribbean workers and other pioneers, who migrated for the construction of the legendary rail track. 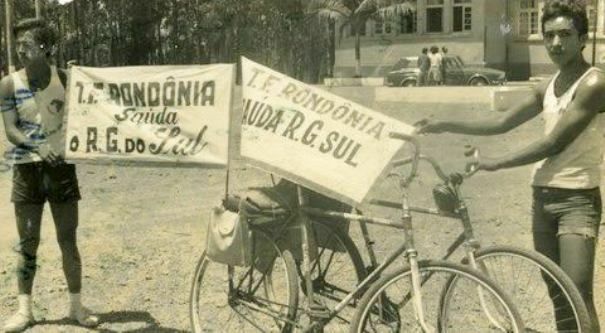 Concluding his secondary studies, the young man traveled by bike the entire 2,425 miles from the Western Amazon to the extreme south of Brazil, journeying between the cities of Porto Velho and Porto Alegre, and bringing to the people of both regions a message of integration signed by the governor of the territory, Colonel Joao Carlos Marques Henriques, which Samuel delivered into the hands of the gaucho governor, Euclides Triches. The journey was finally completed, after 45 days by inhospitable roads in open weather, as described later by Senator Leite Chavez of the state of Parana, from the floor of the Brazilian Parliament, "vocations bear some similarity to the waters that rise in the mountains: whatever the obstacles, they reach their destination, and Samuel Saraiva is no different." After high school, Samuel Saraiva bid a grateful goodbye to the Gaucha Union of Secondary Students (UGES) and headed for Brasilia, to further his dream of studying archeology in Mexico. Impressed by his determination, Senator Adalberto Senna from the neighboring state of Acre covered Samuel’s airfare to Mexico. Upon arrival in that dazzling country, he discovered that guidelines regarding foreigners made it impossible for him to enroll in his desired course of study. Consequently, he opted to study International Relations, entering the Faculty of Political and Social Sciences of the National Autonomous University of Mexico (UNAM). At that time, the Brazilian Ambassador Lauro Escorel de Moraes, following the request of Colonel Carlos Augusto Godoy, hired him to work in the Cultural Sector. 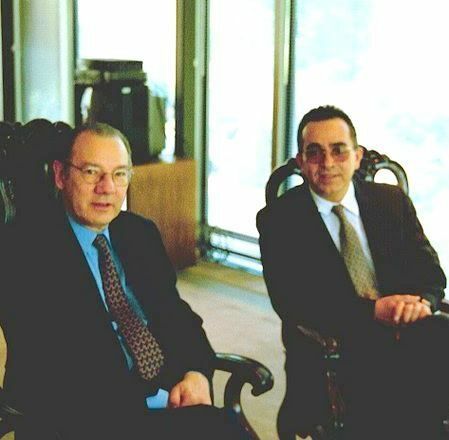 There he supervised a young third secretary, now Ambassador Melantonio Cesário Neto. Saraiva’s university studies in Mexico, land of such an ancient culture, informed his understanding of the Latin American reality. Samuel returned to Brazil in 1980, imbued with socialist idealism, shortly after the demise of the prevailing two-party system (ARENA-MDB) in that country. He aligned with the political group he considered to best represent the aspirations of the people, and, approved by 12 federal deputies, he was assigned by Engineer Leonel de Moura Brizola to represent the Brazilian Labor Party (PTB) in Rondônia, his native state. 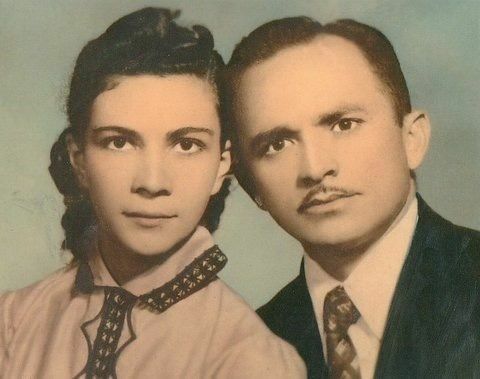 After a long legal battle that resulted in the loss of the acronym for the group of Ivete, the niece of former President Getulio Vargas, S. Saraiva organized and chaired the national Democratic Labor Party (PDT). 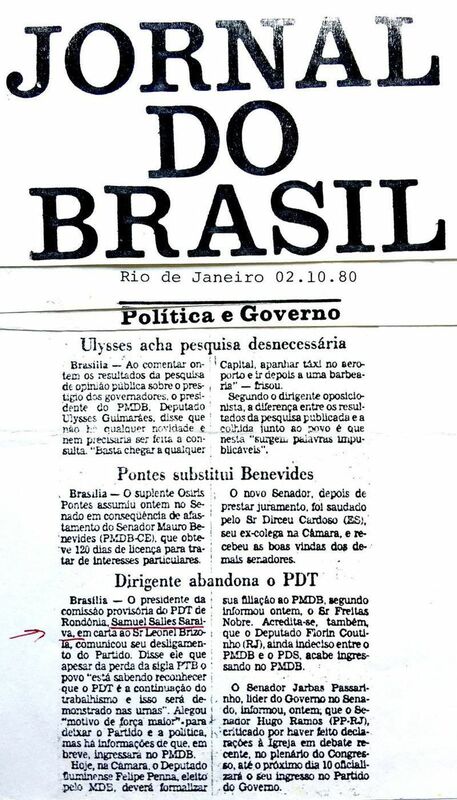 This was led by Brizola, with the participation of colleagues; attorney Antonio Osmar de Sa, Engineer Flodoaldo Pontes Pinto, attorney Maria Cristina Moreira da Silva and Dr. Itamar Kurt Kettenhuber, among other idealists, as stated in the Application for Registration Act, and prepared by the National Executive Committee of the party, that is now part of the archives of the Superior Electoral Tribunal (TSE). In response to his humanitarian vocation, Samuel formed a Committee for Solidarity to help Bolivian refugees migrating to that state, fleeing the violent military dictatorship imposed in that neighboring country by General Garcia Meza. During this time, Samuel also met with the union leader Lula da Silva, an activist in his state, at the Building Feitos in Porto Velho. Among other topics, they discussed strategies for the formation of an opposition front, seeking the prize of the presidency of Brazil, in order to achieve social democratic transformations within the political ideology opposed to the military regime that was established in 1964. Saraiva later accepted the invitation of the regional president of the Brazilian Democratic Movement Party (PMDB), the legendary federal deputy Jerónimo García de Santana, to join the party. His decision was published by the "Jornal do Brasil" in Rio de Janeiro on October 2, 1980. Notable political leaders like Senators Paulo Brossard (PMDB-RS), José Richa (PMDB-PR), Humberto Lucena (PMDB-PB), and the deputies Ulysses Guimarães (PMDB-SP), and Max Mauro (PMSB-ES) all welcomed him. 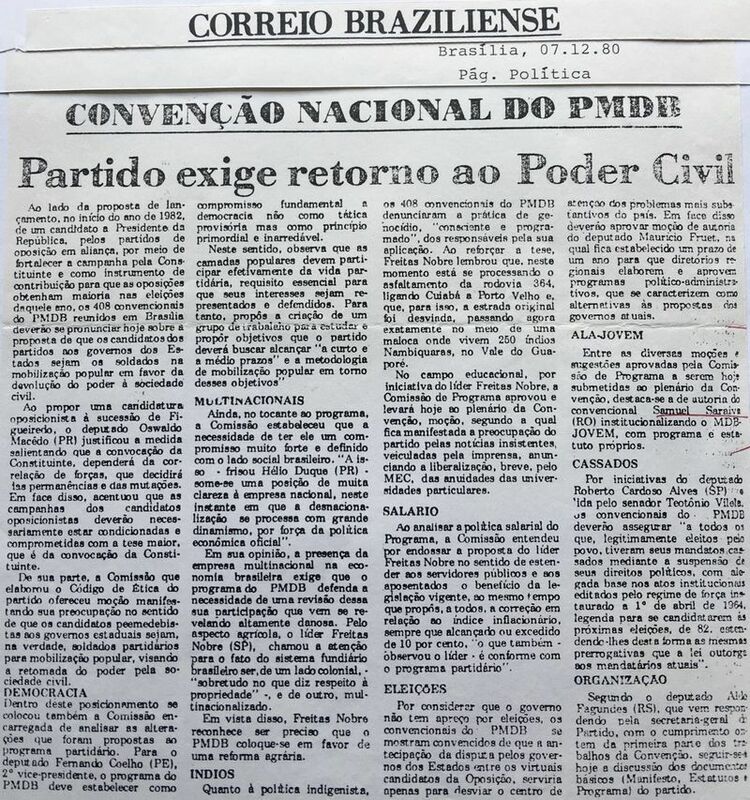 A few months later, the new party held its first national convention, in which Samuel Saraiva’s bill, institutionalizing the National Youth Movement party, with its own program and status, got adopted in the plenary session, as reported by the "Correio Brasiliense" newspaper on July 12, 1980. Two years later he was appointed Federal Deputy Surrogate for the new state of Rondônia by the Regional Electoral Tribunal, and his name published in the book listing Deputies of the 47th Brazilian legislature. 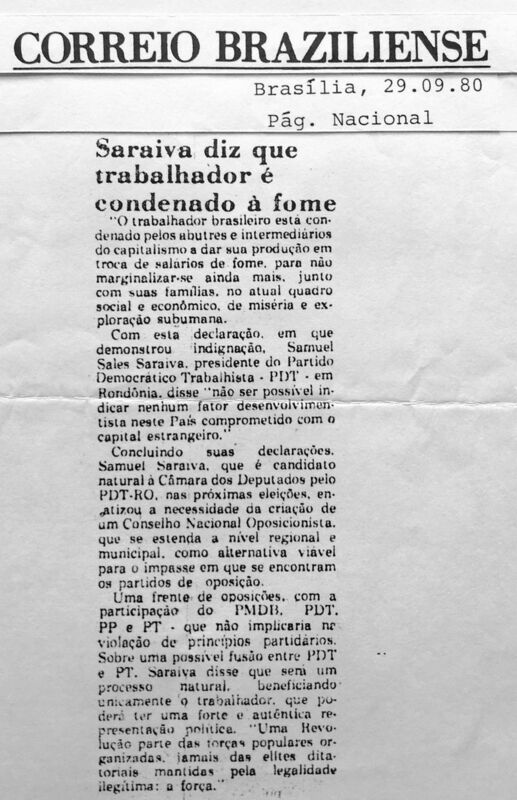 Among dozens of speeches, now preserved in the historical archives of the National Congress of Brazil, regarding Saraiva’s political trajectory, many given by congressmen with different accents and ideological references, even within his own party, it is worth mentioning the speech of Senator Carlos Alberto de Sousa, leader of the Brazilian Labor Party (PTB). His speech was published in the Journal of the Senate of the Brazilian Republic on March 19, 1985 (section II page 0267). At that time, Samuel was completing the Diplomatic Law course at the University of Brasilia (UNB), taught by Ambassador J.O. Meira Penna. Among Samuel’s university teachers were intellectual personalities such as the post-doctorate instructors Joanílio Teixeira, Lytton Guimaraes, David Fleischer, Francisco Resek, Eiiti Sato, Marcio Moreira Alves, Francisco Resek, Márcio Cambraia and Father Joseph Brandi Aleixo. Some of them were masters from the traditional Rio Branco Institute, tutor of Brazilian diplomats. Senator Alvaro Dias (Leader of Podemos), registering a message of outrage from Samuel Sales Saraiva in reference to the decision of the Chamber of Deputies for not accepting a Impeachment against the President of the Brazilian Republic, Michel Temer. (Plenary of SF 08/03/2017). Senator Alvaro Dias (Leader of Podemos), registering Open Letter of Samuel Saraiva to the President Elect Jair Messias Bolsonaro and members of the Brazilian Congress on the urgency to re-evaluate the TRANSFRONTEIRA PROJECT. [Plenary session, DSF 12/11/2018]. 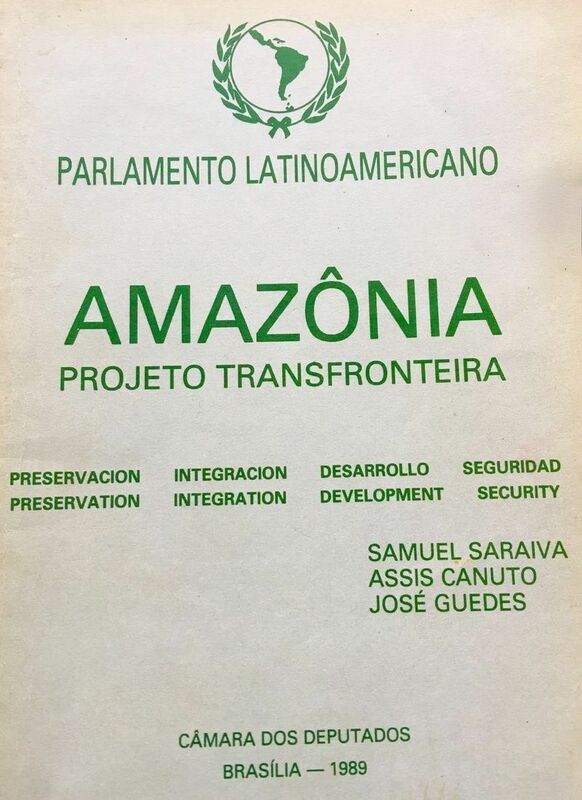 first, "TRANSFRONTERA," which kept the name of the Project; the second entitled "AMAZONIA, Integration, Preservation, Development and Security". Both were translated into Spanish and English. They each included a preface by the Brazilian ambassador J.O. Meira Penna, and were edited jointly by the Chamber of Deputies, the Federal Senate and the Latin American Parliament, and registered by the National Library as intellectual works. It is noteworthy that the books are part of the collection of the Library of the United States Congress. The "TRANSFRONTERA" preceded the so­-called "Calha Norte" project, idealized during the government of Jose Sarney and subsequently elaborated for the defense of the area located to the north of that border. The legislative proposal was presented in the plenary session of the Federal Chamber by the Deputies José Guedes (PSDB­RO), Assis Canuto (PFL­RO) and Raquel Cândido (PDT­RO), having been approved in all the Thematic Committees of the House. Later in 2013, the federal deputy Nilton Capixaba represented it, in the terms of Bill No. 5341. 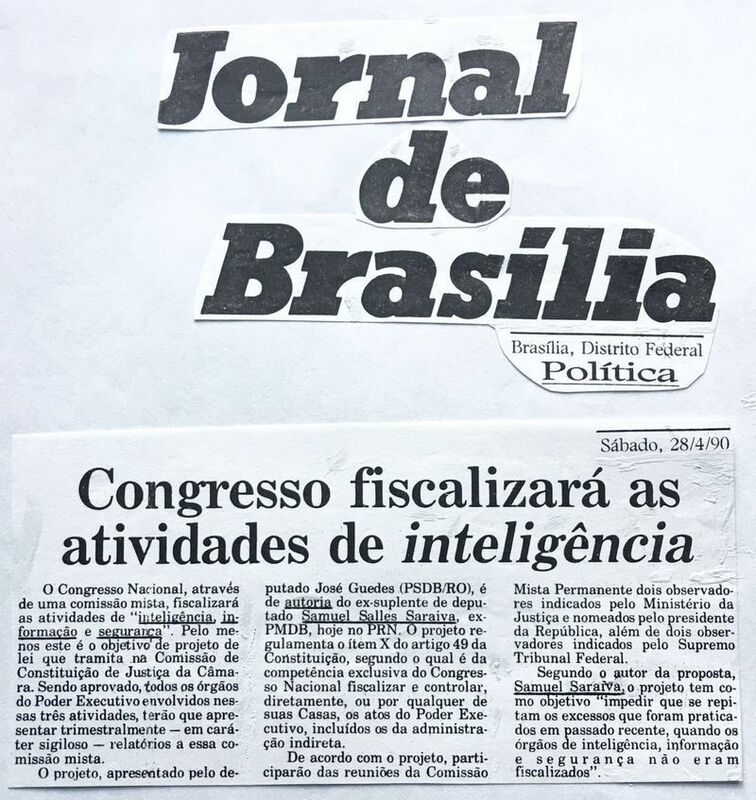 In another bill, S. Saraiva proposed regulation of the X paragraph of Article 49 of the Federal Constitution of Brazil, regarding the need for oversight of intelligence, information and security by Congress, in order to prevent the recurrence of excesses practiced during the former military regime (Jornal de Brasilia 28/04/1990). 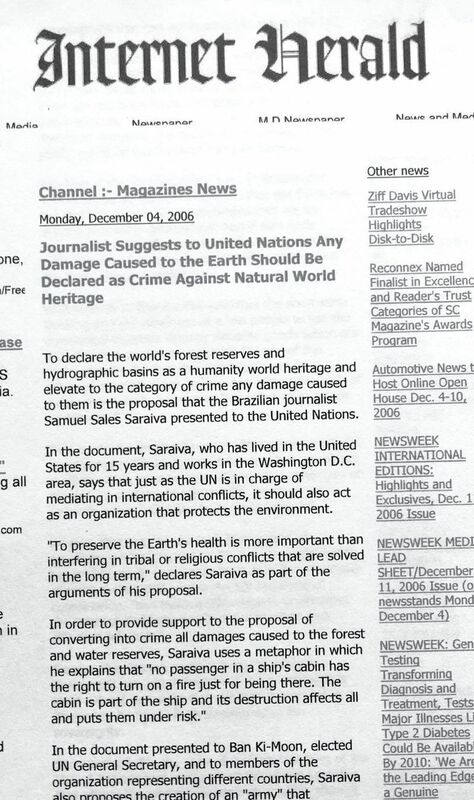 A few years later, S. Saraiva prepared draft Bill No. 1163/1991, to create a national registry for assistance to those dependent on narcotic, psychotropic and chemical substances. Federal Deputy Jabez Rabelo (PTB-RO) introduced the bill. One of the co-signers of the bill was Eduardo Braga, former leader of the Government of Dilma Roussef and Minister of Mines and Energies. In the Justice and Drafting Commission, the recorder for this issue was the enowned legal scholar, Deputy Helio Bicudo (PT­SP). 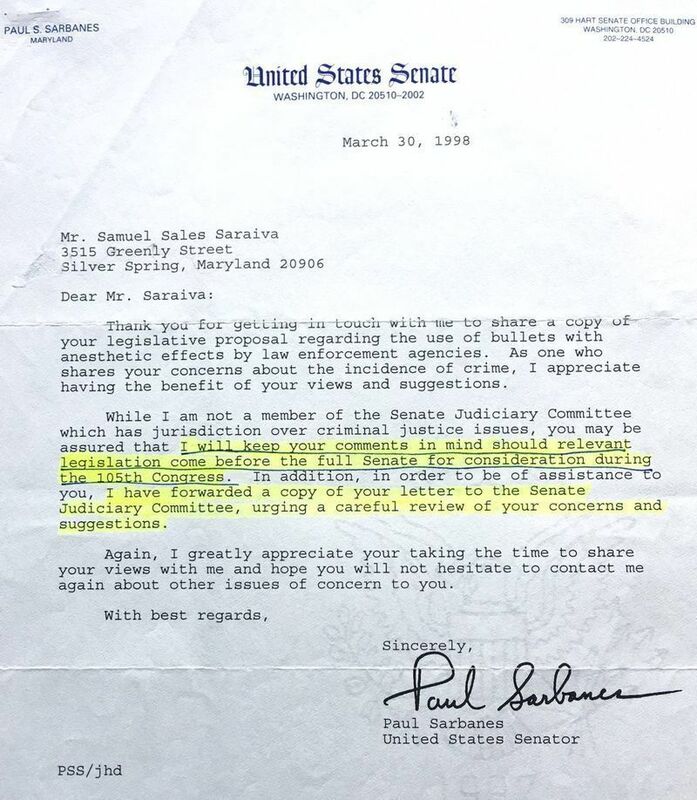 Samuel Saraiva developed a Legislative Proposal requiring the use of anesthetics in the rounds used by Public Safety Agencies and Private Security Agencies.The proposal was submitted for study by the Legal Committee of the United States Senate, at the request of Senators Paul Sarbanes and Barbara Mikulski, in the 105th Legislature [Washington D.C.]. 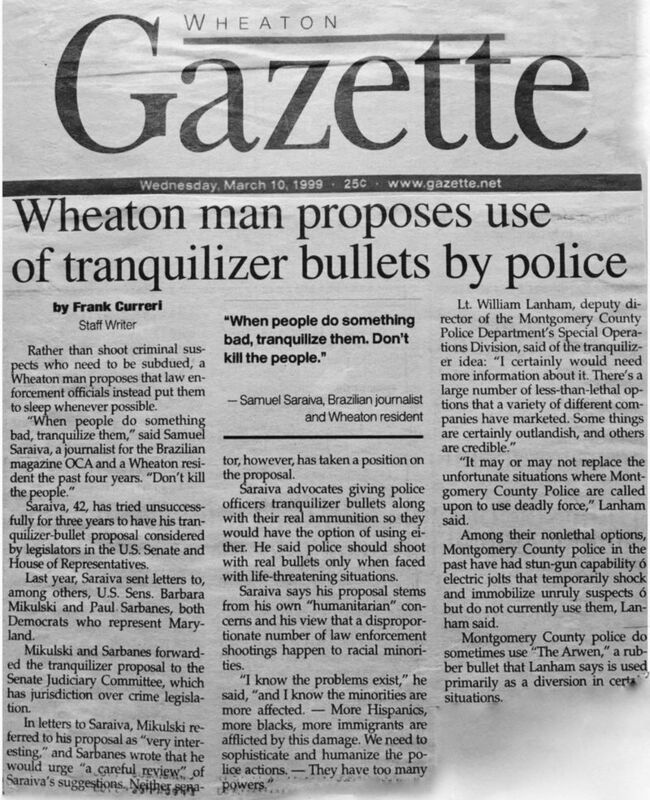 This was published in the Journal Gazette of the City of Wheaton, Maryland on March 10, 1999. 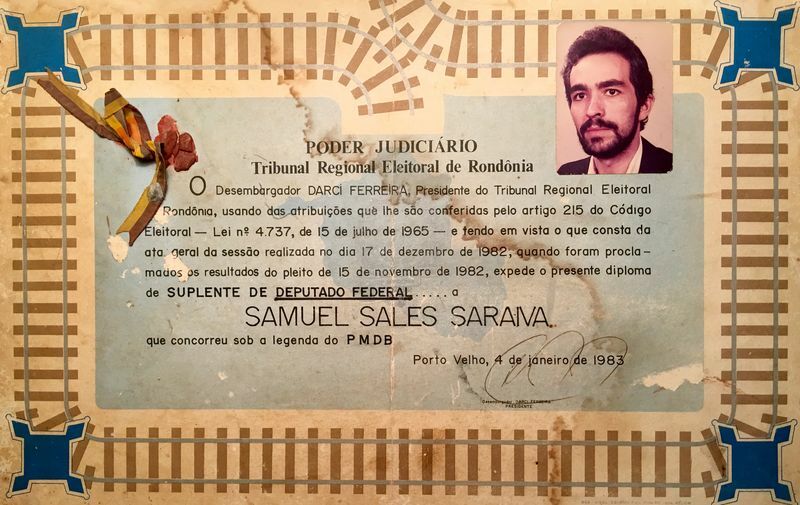 With remarkable insight, Samuel Saraiva walked the thread between the spirit of the law and the Brazilian Judicial System, by suggesting to the president of the Brazilian Federal Commission of Constitution and Justice, Senator Bernardo Cabral (PP­AM), the development of a legislative technical study to form a National Disciplinary Commission.This commission would have powers that could dismiss judges for misconduct. External control of the judiciary originated with the legislative opinion of the Brazilian Federal Senate No.196, 1997. 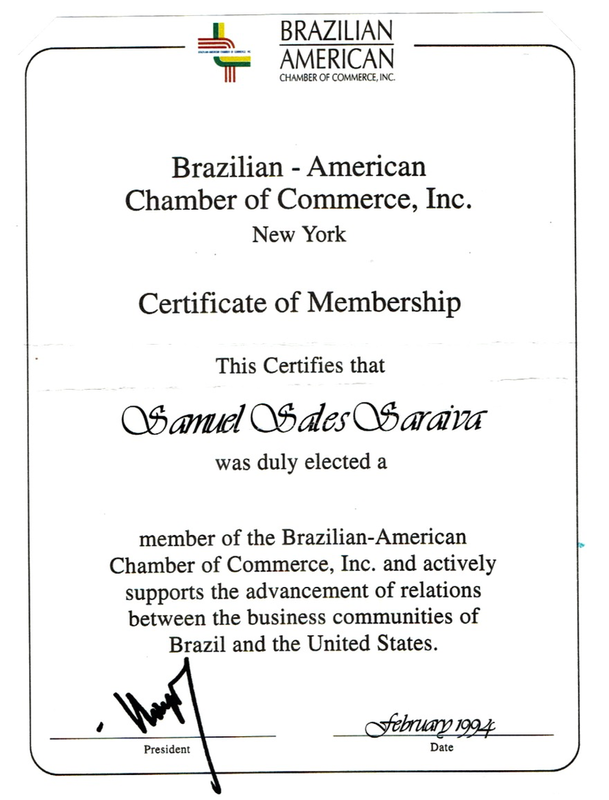 Management for the Legalization of Brazilian Citizens in the U.S. 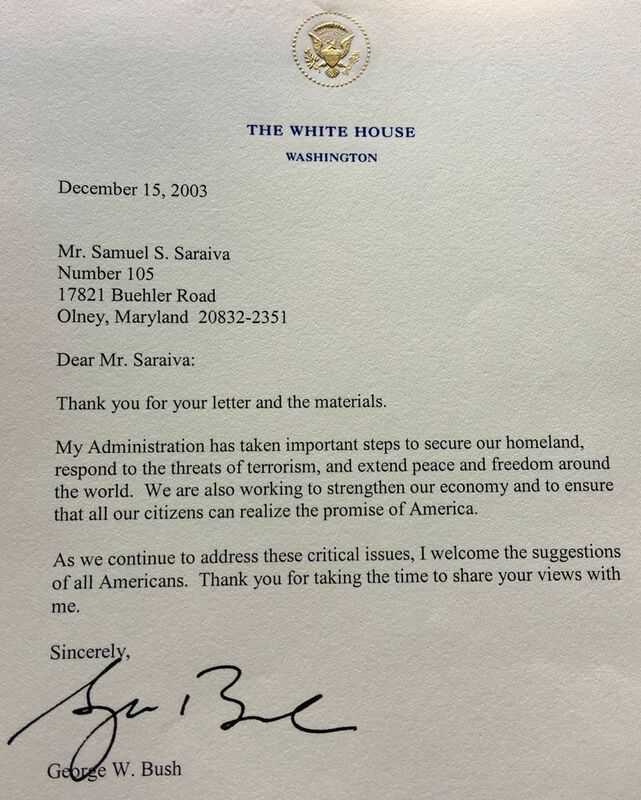 In 2003, President George W. Bush sent a message to Samuel Saraiva, thanking him for his studies in strengthening bilateral relations. The document proposed new Brazilian immigration legislation that would allow American citizens to emigrate to Brazil if the United States were attacked with weapons of mass destruction or suffered a natural disaster of great magnitude. Among the consequences that could be generated by a friendly unilateral action by Brazil, Saraiva envisioned American reciprocity, which could facilitate the legalization of more than a million undocumented Brazilians in that country. The proposal impacted the Senate of Brazil. 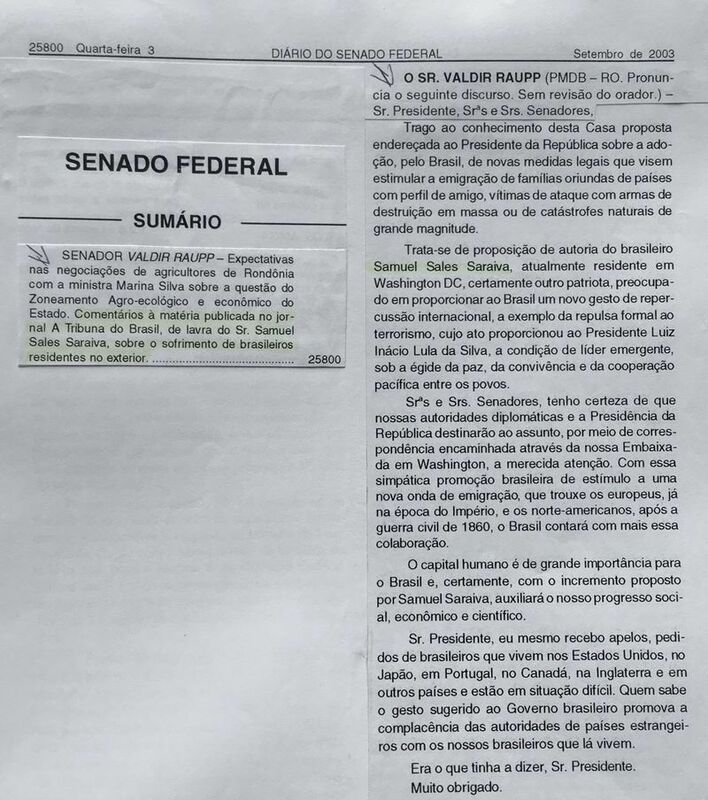 Senator Valdir Raupp made a speech at a Plenary Session of the Federal Senate, asking President Lula da Silva and the Foreign Minister to bring actions to implement the suggestion. (SF-03/09/2003). Saraiva was also concerned about the success of Brazilian youth and the opportunities they deserve. Thus, on December 20, 2004, he presented a bill regarding youth inclusion in the academic system, and the provision of Student Community Service as a prerequisite for obtaining a high school or preparatory school diploma within the networks of both public and private sectors. Samuel founded draft legislation instituting a Cadastral Register of needy children residing in Brazil and of Brazilian citizens living abroad, for the purpose of providing philanthropic voluntary material assistance. 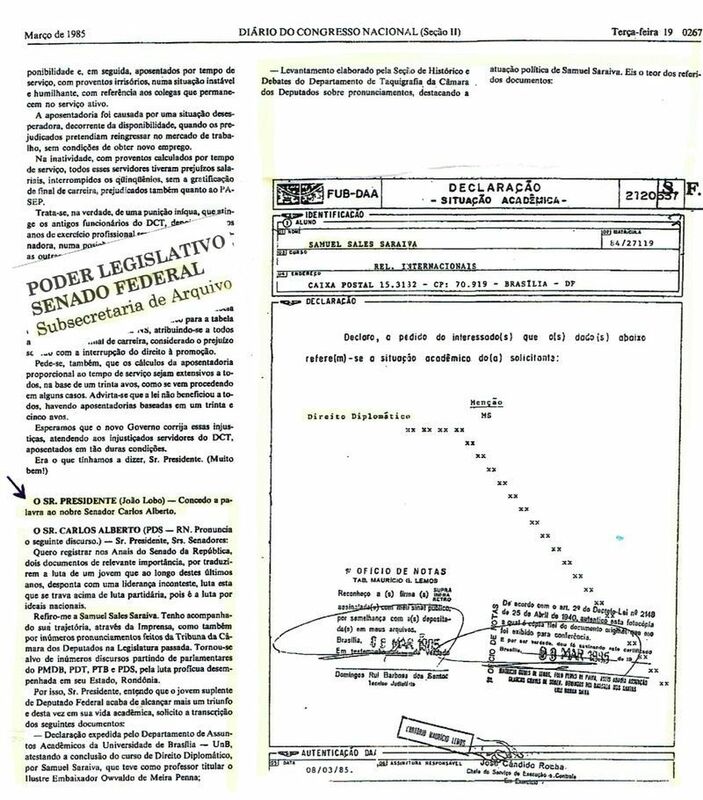 The proposal was highlighted in the Plenary session of the Federal Senate by Senator and Vice Leader Mario Calixto Filho, as published in the News Agency of Parliament on September 17, 2004. In 2009, the Federal Deputy Manoel Junior (PMDB­PB) and more than 183 parliamentarians signed the Proposed Amendment to the Constitution [No. 436, of 18/11], heightening the third paragraph of Article 45 of the Federal Constitution, granting to residents living abroad the right to vote and choose representatives to the Chamber of Deputies. The proposal was supported by the Committee on Constitution and Justice, and the formation of a Special Committee for deliberation was expected. 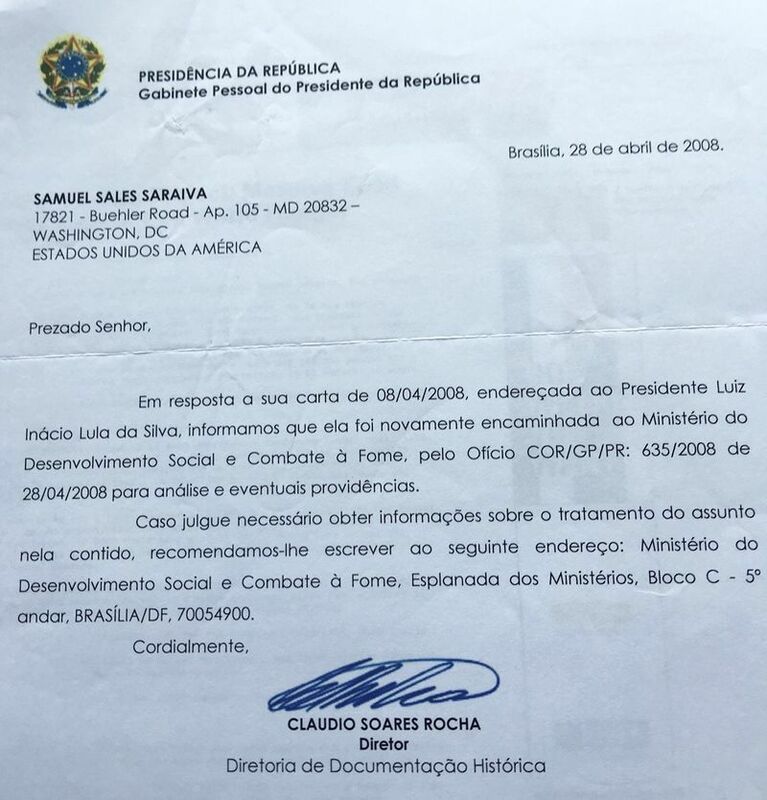 On February 24, 2010, the same Congressman who dealt with number 559 welcomed the draft law of Samuel Saraiva on the creation of a social contribution for Brazilians living abroad by natural or legal residents established in Brazil. The measure proposed to provide resources in emergency situations for the attention of those Brazilian citizens residing outside the country. 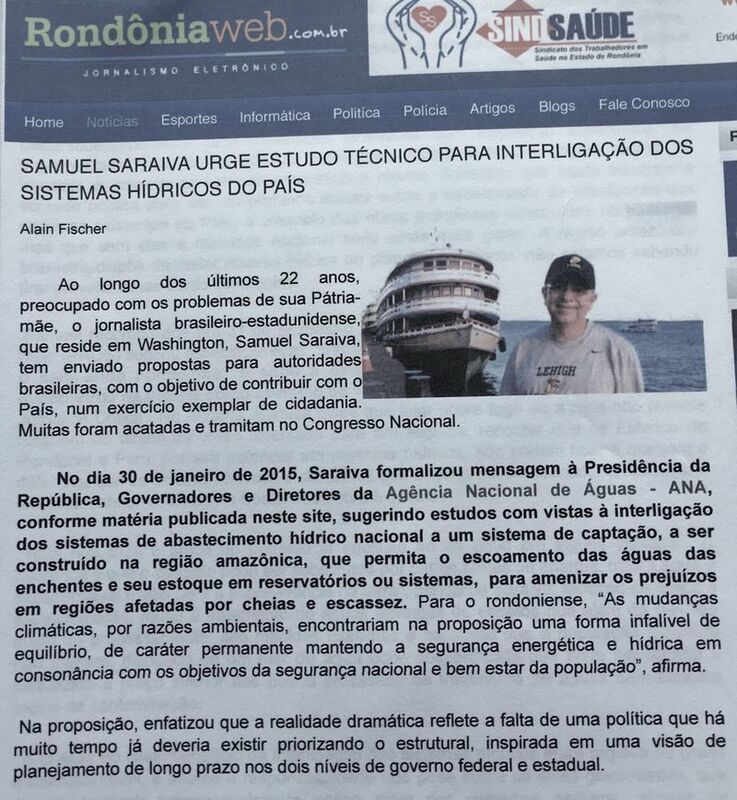 In 2011, Samuel Saraiva presented a legislative study to the President of Brazil, advocating the inclusion of a specific field of study in the preparatory and high school curriculum, in order to awaken interest in future generations about environmental preservation. 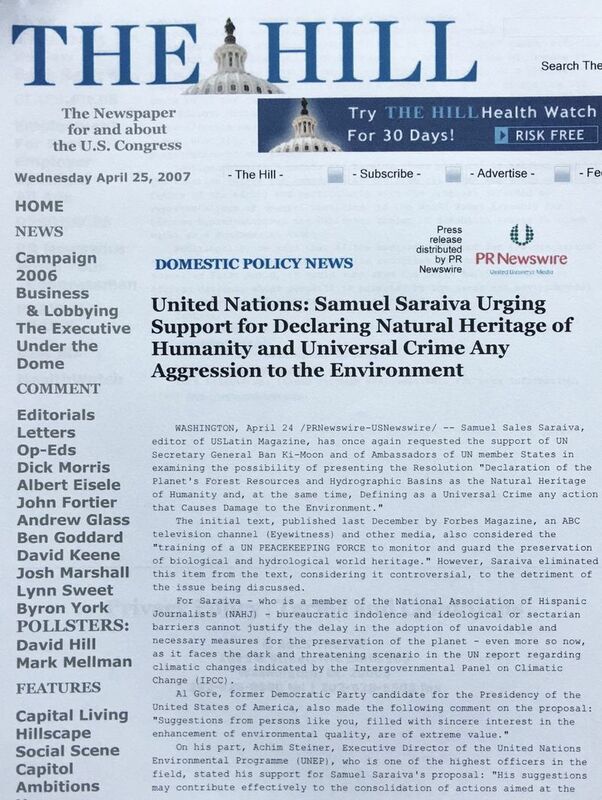 At the same time, Samuel suggested requiring students' commitment to the moral principles essential for human coexistence, and defense training of young people for identification and non-violent resolution of conflicts: education aimed at promoting ethics, citizenship and peace. The concept was posted on the website www.gentedeopiniao.com.br on 8 December 2011, and in June 2015 it was sent to Federal Congresswoman Mariana Carvalho (PSDB-RO) for her consideration. The same initiative proposed addressing the causes of child and youth violence, corruption and degradation by adopting specific areas of study in public education, in order to better prepare future generations. 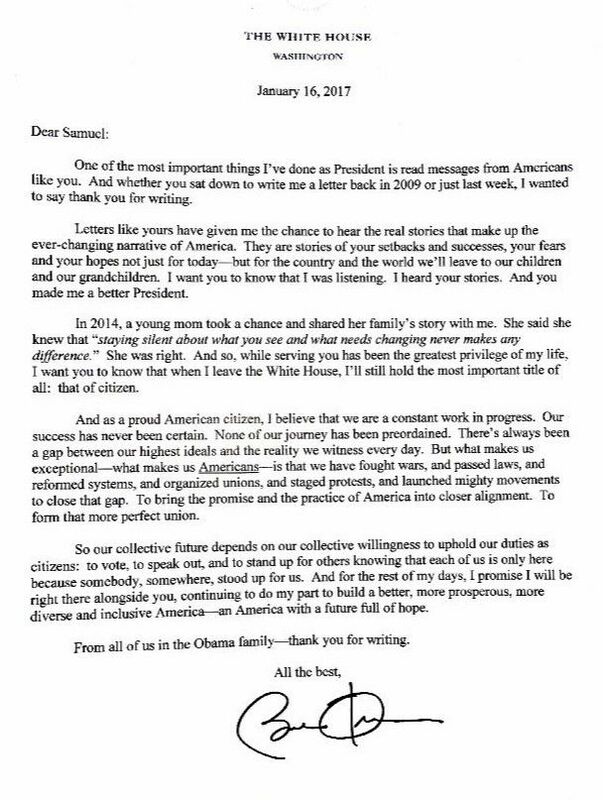 This was posted on July 9, 2015. With the intention of making the activities of the employees of the Ministry of Foreign Affairs (Itamaraty) more efficient, Samuel Saraiva drafted the proposal for a legislative study presented to Senator Alvaro Dias (PSDB-PR). It became mandatory to provide free distribution of forms from the consular offices in order to grant Brazilians residing abroad, the Registration Option Index of Satisfaction with the provision obtained. That record would also allow the inclusion of complaints and comments, protecting the confidentiality of the information. 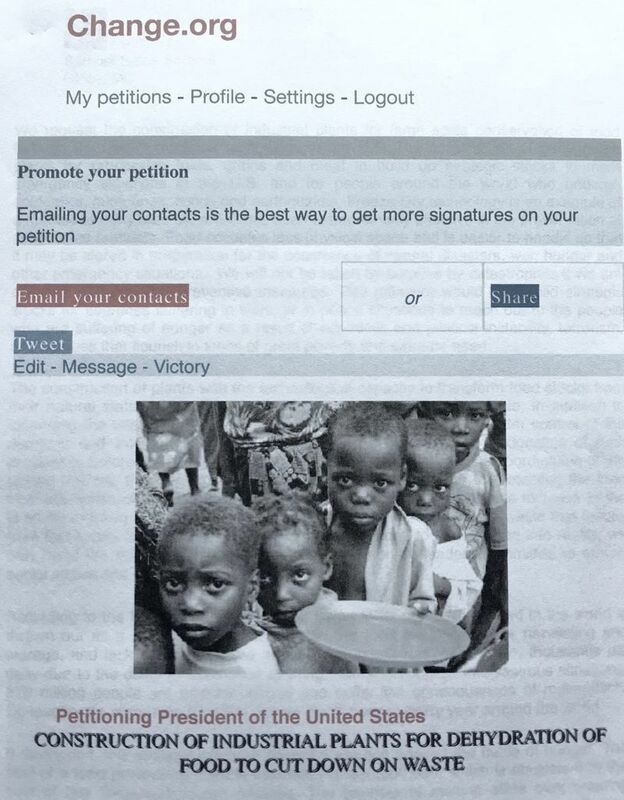 This form should contain the address or email for exclusive reports of the Chamber of Deputies, the Senate and the Federal Public Ministry. The proposal was posted on May 11, 2011, on the site www.gentedeopiniao.com.br. 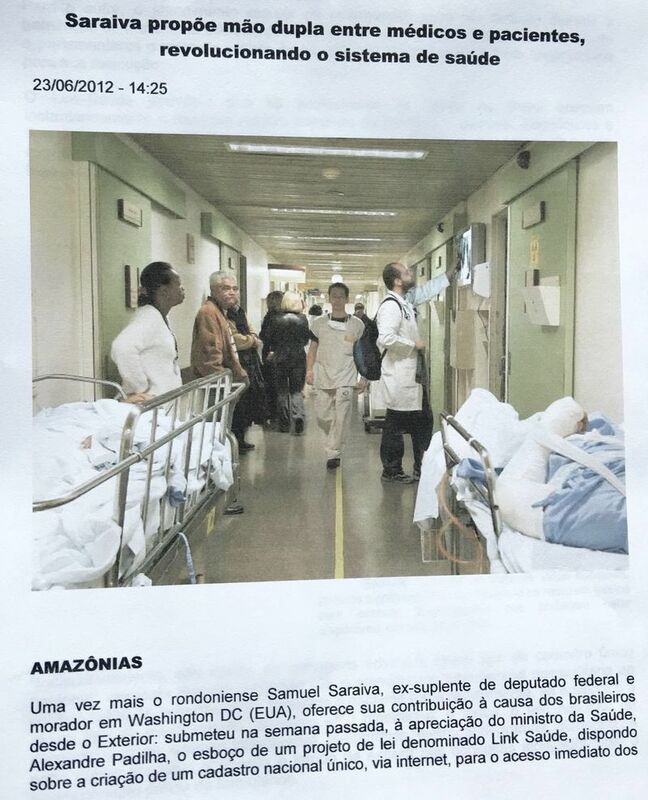 Samuel Saraiva proposed a bill to create a National Single Registry that would allow doctors immediate access to the clinical records of a Brazilian patient, for the purpose of regular or urgent care. It was recorded by the Unified Health System (SUS) of the Ministry of Health under No. 123652, on June 20, 2012. The proposal received support from other professionals, including Dr. Denise Sistorelli, Professor at the Federal University of the State of Goias. In July 2014, before scandals engulfed the state authorities of Brazil, Samuel Saraiva proposed the creation of a joint committee composed of members of the Superior Electoral Tribunal, the Court of Audit of Accounts of the Union ,the Comptroller General and the National Council of Justice. This committee would develop technical and legal studies proposing the adoption of legal mechanisms and permanent patrimonial monitoring of financial holders or applicants’ mandates, and of executives of the first, second and third levels of the administration charged with the management of public resources. As a consequence of the terrorist-religious attack that occurred at the Charlie Hebdo newspaper in France, Saraiva suggested to the Franco-Brazilian deputy Eduardo Cypel of the French National Assembly, that he promote a broad debate on legal rules that could inhibit excesses in the freedom of expression, ensuring the preservation of dignity, respect and inviolability of the exercise of faith, fundamental to human dignity and peace. 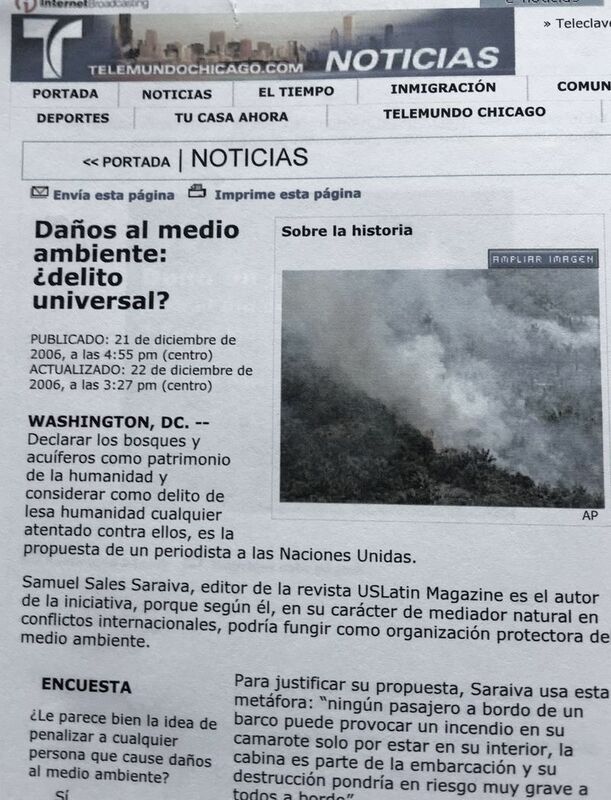 The proposal was posted January 14, 2015 on the website "Gente de Opinión". 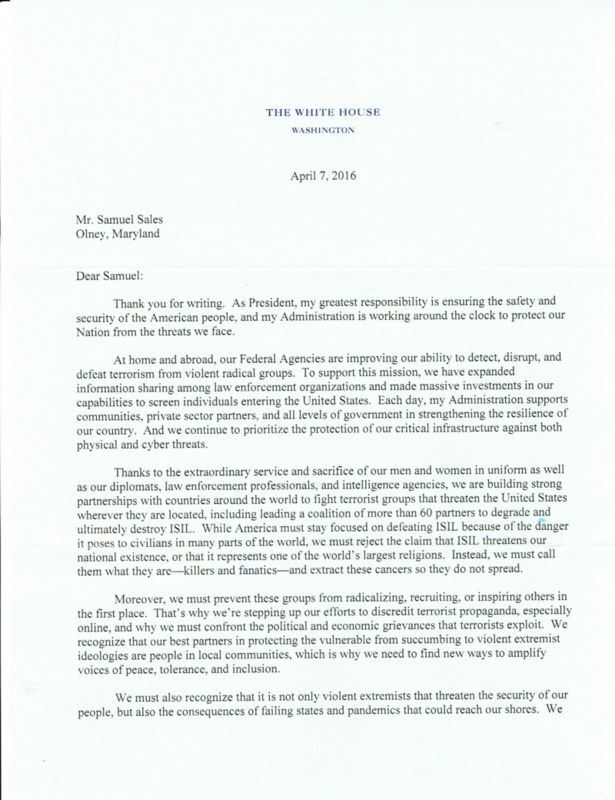 Saraiva sent a message to the President of Brazil, and to the governors and directors of the National Water Agency (ANA) in January 2015, stressing the need for studies on integrating the National Water Supply Systems with a project that would be built in the Amazon. Such a system would allow the collection of surplus water during the rainy season, and reserve it in storage spaces or systems to more definitively normalize the recurring problems of seasonal water scarcity. Samuel Saraiva devised a draft bill which was supported by the federal deputy Manoel Junior (PMDB-PB). Manoel presented it at the plenary session of the National Congress [PL No. 1654/2015], ensuring the use of polygraph evidence as valid evidence in criminal proceedings, when required by the inquiry. 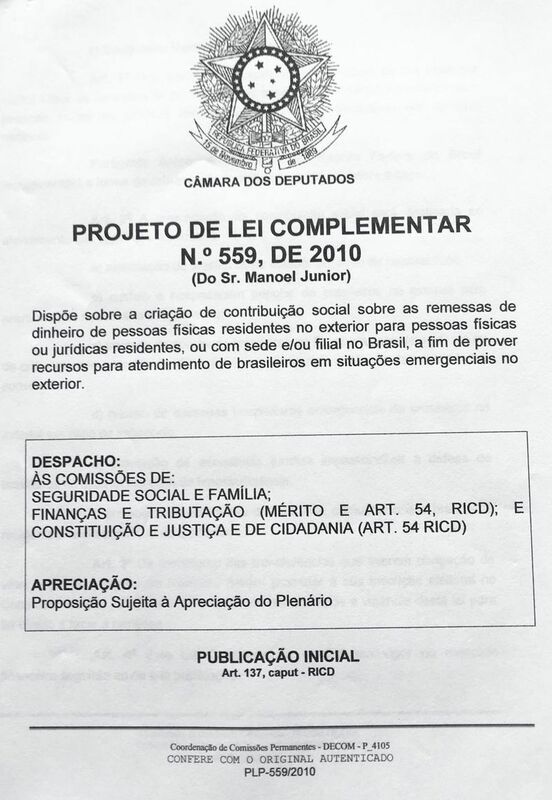 In October of 2014, Samuel Saraiva presented to presidential candidate, Aécio Neves (PSDB-MG), the theme of "simple and direct," for the distribution of a portion of the royalties [compensation scanned area] corresponding to extracted mineral resources, as a legitimate right superseding political, religious or philosophical sectarianism. On January 25, 2016, Samuel Saraiva presented to the Maryland state Assembly member Anne R. Kaiser, a proposal for drivers license holders to include an optional symbol indicating their wish to be cremated in case of a fatal accident or death from other causes. Samuel felt that this democratic measure would ensure compliance with the citizen’s preferences. 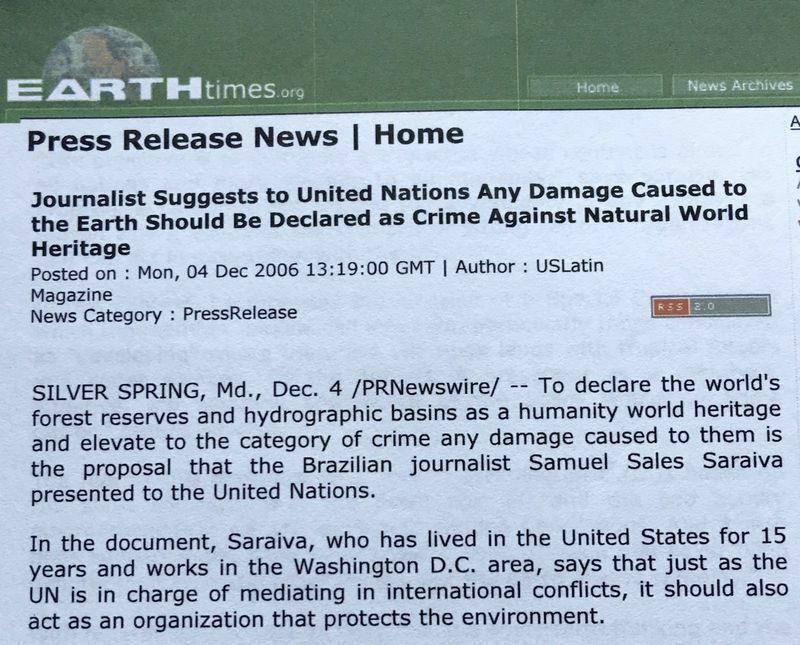 In the United States, which has granted Saraiva the citizenship that he so proudly holds, Samuel began his journalistic activities in 1992. He was accredited by the Department of New York State Police (NYPD), and wrote for a community magazine. 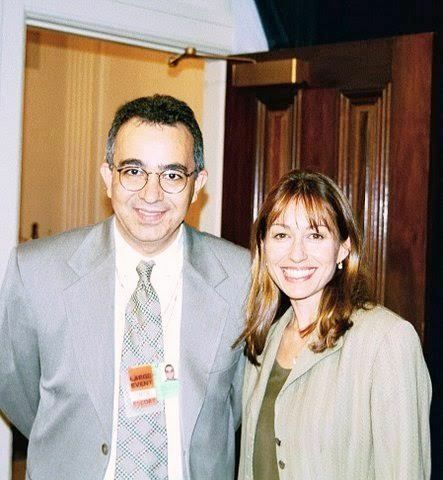 Once transferred to Washington D.C., in 1994, he joined the National Press Club (NPB) and the National Association of Hispanic Journalists (NAHJ). Later, he accepted the invitation of journalist Carlos Speranca, President of the Union of Journalists of Brazil, Rondônia section, to work as the correspondent in the USA for the magazine "Momento Brasil" and the websites "Gente de Opinión" and "RondôniaWeb ". 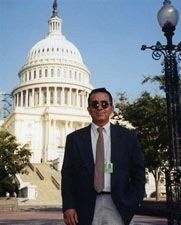 In October 2000, shortly after founding the magazine "US Latin," together with former US Ambassador John Kean, Samuel Saraiva assumed the role of editor and was invited by the White House during the Clinton Administration to participate in the Conference on "the growing importance of the Latino population in the United States". 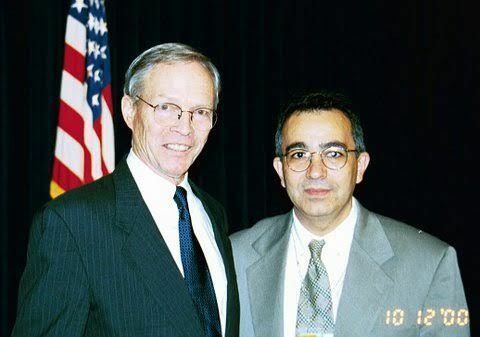 Some years later he received an award signed by President George W. Bush for the studies developed regarding strengthening bilateral relations between the US and Brazil. In the proposal, Samuel Saraiva suggested to the presidents of the two countries to promote a debate involving both countries, in the Chambers of Congress, aimed at the development of legislation to facilitate residence for immigrants from both nations. As it developed, they would have the right to permanent residency in emergency situations, such as nuclear attacks or natural disasters of great magnitude. It seemed to Saraiva, that if Brazil took the first step in this direction, it would generate an extremely positive political factor and could mean the possible legalization of approximately one million Brazilian citizens in the US currently considered "undocumented." In Brazil, the proposal was welcomed by Senator Valdir Raupp (PMDB-RO), who, in a speech at the plenary session of the Federal Senate on September 3, 2003, asked President Lula da Silva and the Ministry of Foreign Affairs to adopt the proposal. 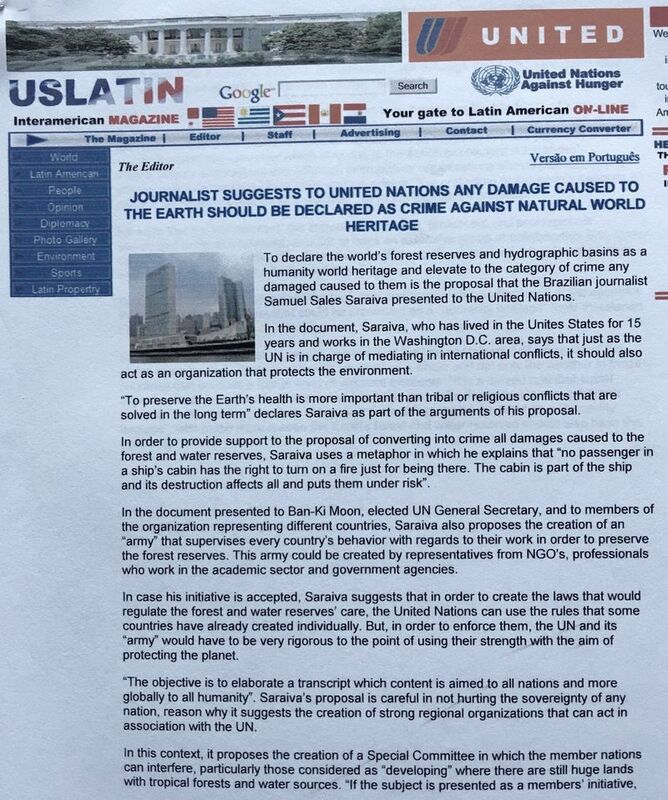 An environmentalist with a relentless concern for environmental preservation, Saraiva developed and submitted a document to the Secretary-General of the United Nations (UN), Mr. Ban Ki-moon, and the Ambassadors of member countries with a presence on the Security Council. The document would declare all water sources on the planet, as well as the reserves of tropical forests, part of the heritage vital for all humanity. 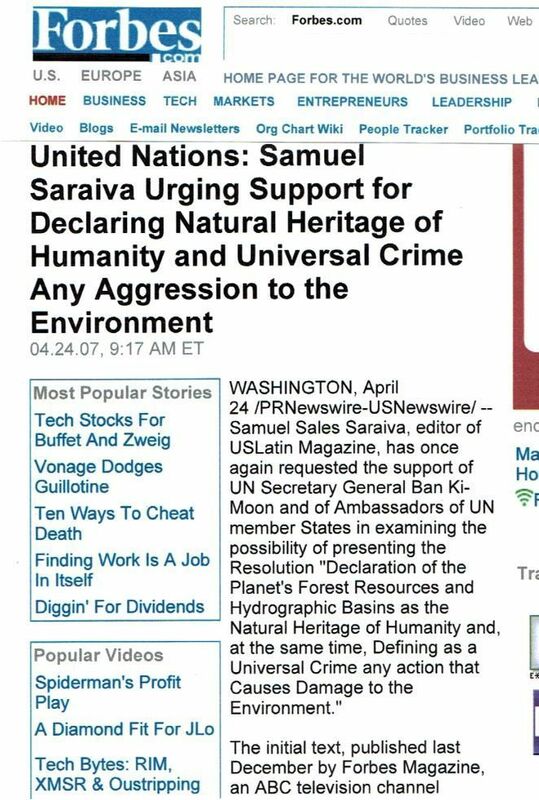 Saraiva proposed in this document to make a universal criminal offense any action of aggression causing damage to those vital reserves, for the life of the planet. He also defended the training of the UN Peace Corps to intervene, when convened by any of the member countries, to help governments combat such threats. Samuel Saraiva justified these measures as addressing immediate needs, stating that, "We are guests, not owners," of that heritage, which is the birthright of future generations. His proposal was publicized in a variety of media, following the example of Forbes Magazine’s article, published on December 20, 2006. The ABC Television Network Eyewitness did the same on December 24, 2006, following Telemundo, a Spanish television channel, which highlighted the issue on December 23 of that year. 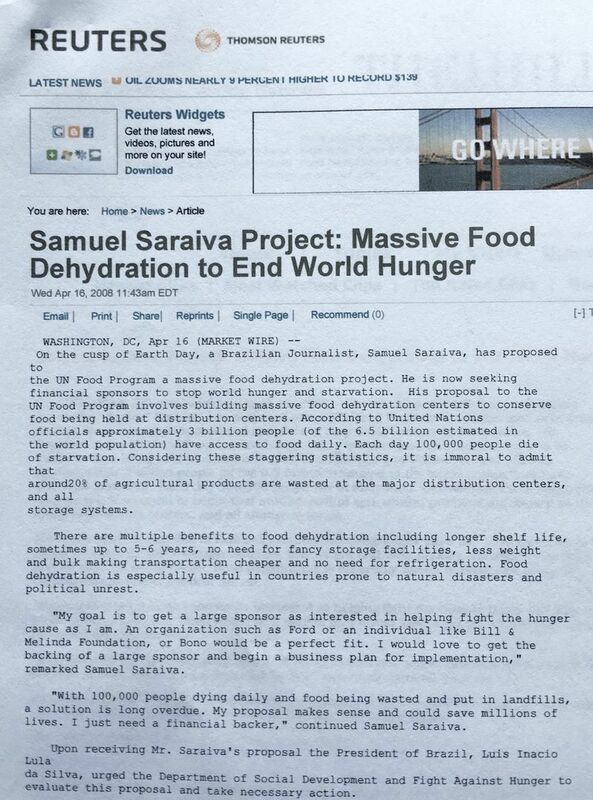 In May 2008 Saraiva became concerned about the alarming food shortages which cause millions of deaths world wide, while hundreds of tons of food deteriorate due to improper storage or expiration before consumption. 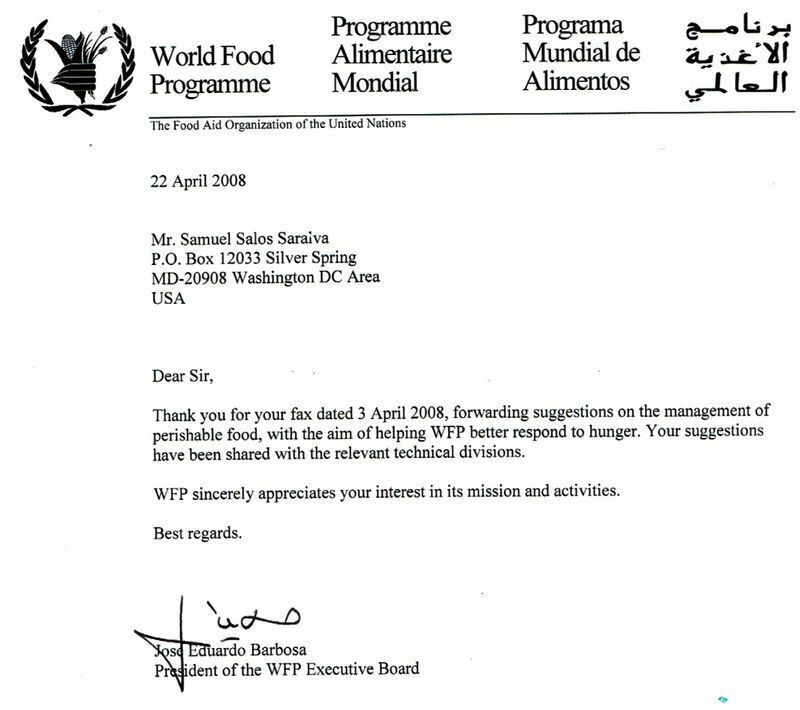 Together with the Executive Director of the World Food Programme (WFP), he called for effective action by both the government and the private sector, with emphasis on the large-scale construction of industrial plants for food dehydration, in order to handle emergencies for populations scourged by economic, war or natural disasters. These crises would include those caused by tsunamis, floods, prolonged droughts, hurricanes, and earthquakes. 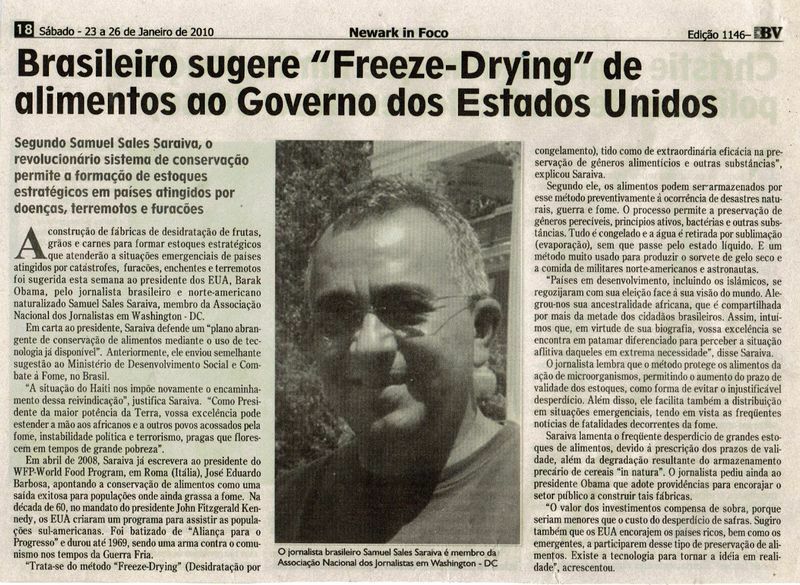 The proposal was also shared with the Obama government of the United States, to whom Samuel Saraiva suggested studies for the expansion of strategic food reserves, with the use of 'freeze drying' technology. The proposal was published in the Portal www.prlog.org on January 26, 2010. 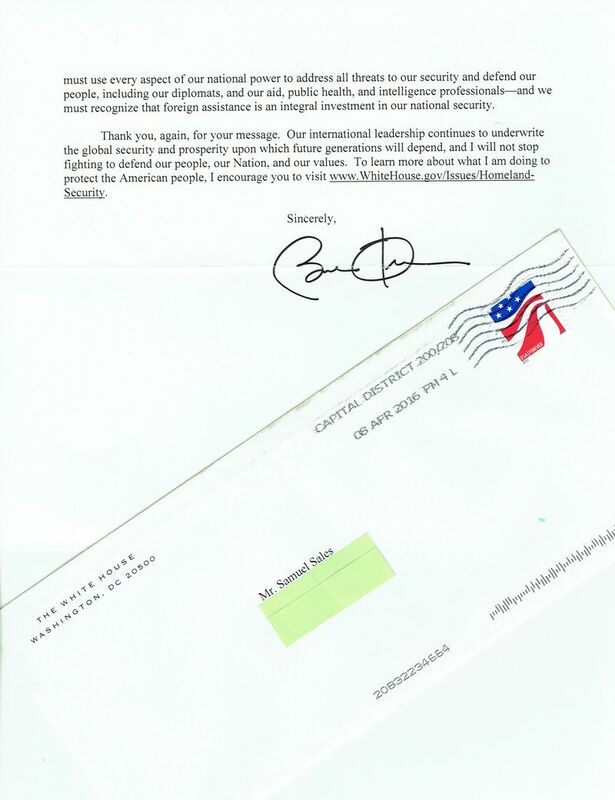 On November 17, 2015, Saraiva sent a message to President Barack Obama, extended to the Central Intelligence Agency (CIA) and other security government agencies, suggesting studies on the creation of a Global Reward Fund to be administered by the UN, and intended to reward information providers who proactively fight conspiracies and prevent the development of terrorist actions. The Global Reward Fund could institute monetary prizes and education, as well as the legalization of immigration status and the preservation of the identity of informants. It seemed to Samuel that the creation of such a mechanism would generate significant motivation for young people and members of Muslim communities who identified with Western culture and values, to denounce conspiracies, thereby preventing terrorist acts from being committed by extremists in the name of Islam. 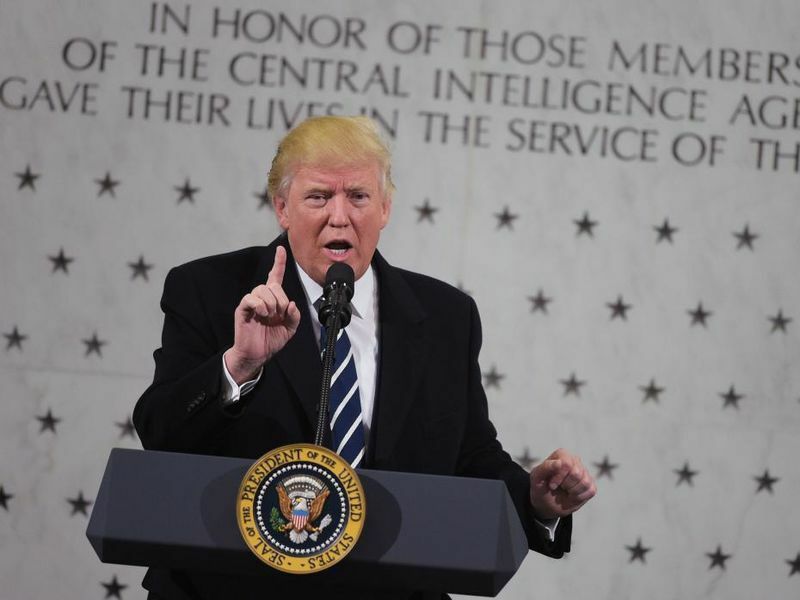 Saraiva stressed that resources for such a fund would be trifling compared to the cost of a missile, and tiny compared to a multimillion dollar national budget for military and intelligence operations. The proposal was registered on the site of the publication 'Amazonia', on November 17, 2015. Samuel Saraiva proposed a partnership between Brazil and the US based on friendship, trust, cooperation and mutual respect, and grounded in historical references and practices in military, economic, political, social and cultural arenas. After being sent to the presidents of the United States and Brazil, the subject was published on the site 'Amazonias', by noted journalist Moctezuma Cruz. Venturing into a private initiative in 2009, Mr. Saraiva formed a company called 'SemperFi Management Contractor LLC' in the state of Delaware, which is also registered in Maryland. In 2015 in Washington, D.C., he received the Minority Business Certification - MBC - of the Capital Region Minority Supplier Development Council (CRMSDC) and the Maryland Department of Transportation. The company was included in the database of the American Federal Government System. Currently it is developing a project for the construction of "shelters" (a type of refuge) in the metropolitan area of Washington DC, to serve as a protection in case of attack by weapons of mass destruction. The company obtained a License of Home Improvement from the State of Maryland, approved by the Maryland Court of Justice. 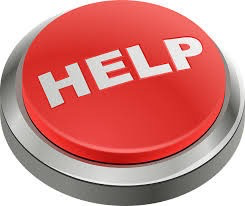 In 04/04/2016, Samuel Saraiva suggested, to the Apple executives Steven Jobs and Tim Cook in an open letter to Apple, proposal creating a free global application that would be named HELP. 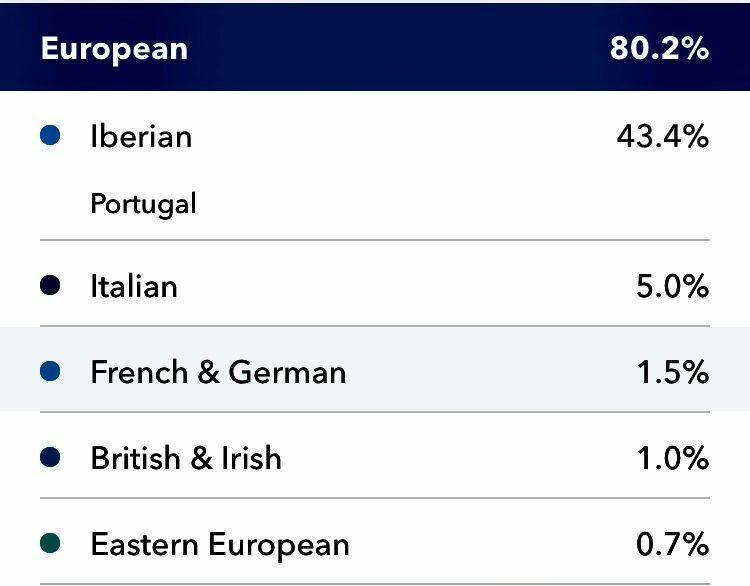 For all the Apple languages, this public service would allow for a data bank that would benefit people in need of some sort of help and those who, in some way, can, wish or would like to hear the stories that sensitize them and where they would be able to practice fraternity. 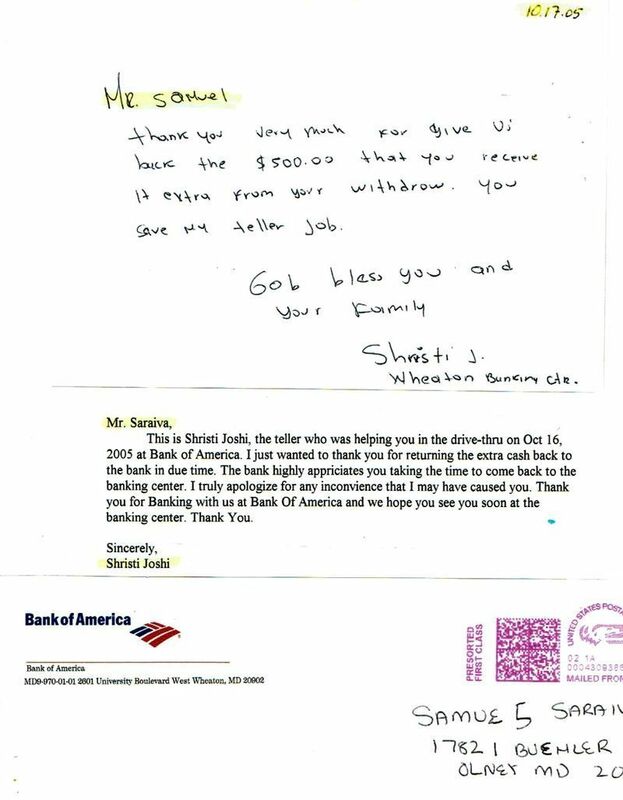 Samuel Saraiva has participated voluntarily in Donald Trump's election campaign since the primaries, operating in the states of Virginia, Maryland, Washington, DC, and Pennsylvania. 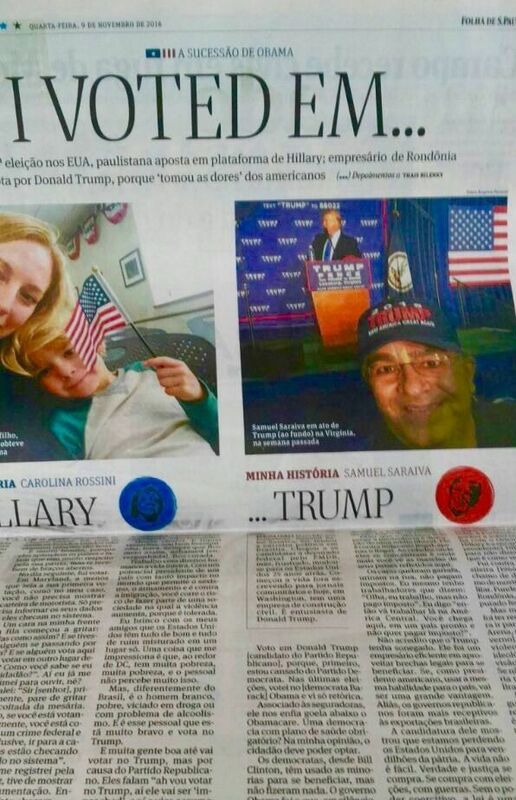 Contrary to Brazilian press action that tried to influence the vote of thousands of American citizens of Latin origin, Samuel defended the vote in Trump, for the reasons explained in an interview granted to Brazilian journalist Thais Bilenky, published on November 9, 2016 by Folha de São Paulo, under the title: "Brazilian businessman says he voted for Donald Trump because he ‘took the pains’ of American patriots". He also suggested to President Trump to pursue a study for the expansion of R.H. 4291 - Immigrant and Refugee Liability Act - making polygraph testing mandatory for obtaining tourist visas, green cards, and citizenship. The 2016 presidential election was dictated by the media's manipulation of information which caused greater polarity and hatred between those at opposite ends of the partisan spectrum. It’s imperative, then, that until Congress considers discussing adequate rules regarding what the media reports and how to measure its veracity, that President Trump himself should issue an executive order to punish and silence the press organizations spreading lies, rumors, and hate. The media has a strict obligation to report the news with absolute impartiality, and to never act in a way that would bend facts or make up lies for the sake of greater sales or clicks. The opposite has occurred, though, with many news organizations crossing ethical lines and thus creating stress and strife for the newly-elected Donald Trump. We request that the President consider the following penalties for those journalists or media companies spreading lies: immediate shut-down of operations for any company reporting false facts, as well as any appropriate criminal penalties that treason carries for company heads or journalists at fault, including high monetary fines. There must also be extensive sanctions against foreign correspondents, such as the suspension of their work visas in this country if they too aid in the hate mongering and lie-spreading in their home country media outlets. "Manaus, Amazonas, May 5, 2013. 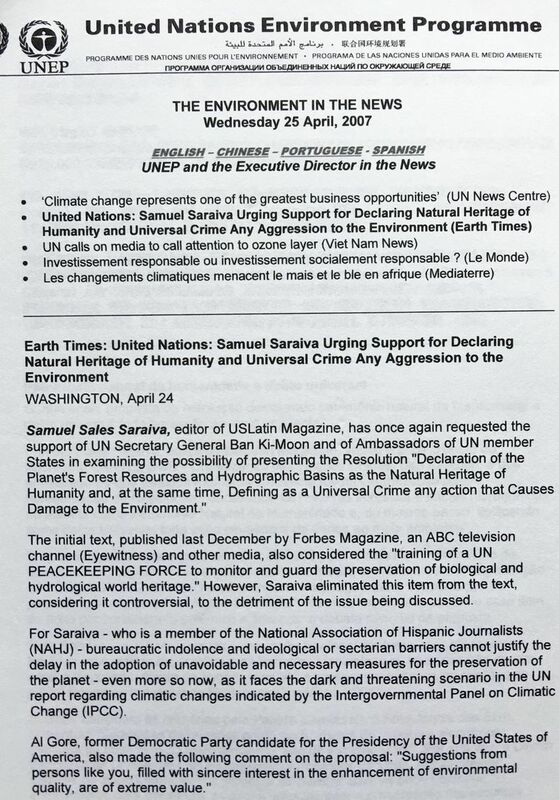 In the exercise of my citizenship, I submit to the consideration of your ministry, the Application for the Medal of Merit Award, for the journalist Samuel Sales Saraiva, former Surrogate Federal Deputy, for his continued dedication to the causes of broad national interest over more than 3 decades, of which I am a witness and admirer. 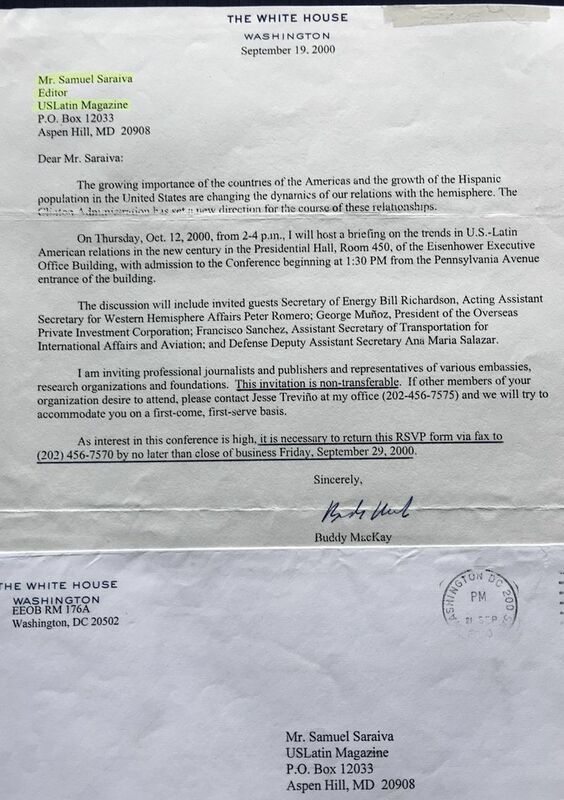 At the time that the draft law called 'Calha Norte' was outlined from the military viewpoint by the National Security Council and National Information Service (SNI), Samuel Saraiva had already completed the 'Transfrontera Project,' inspired by a civilian concept, which proposed the planned occupation of the international border of the Amazon, for the attainment of national security objectives, and the integration, development and environmental preservation inspired by the nationalist teachings and example of his father. 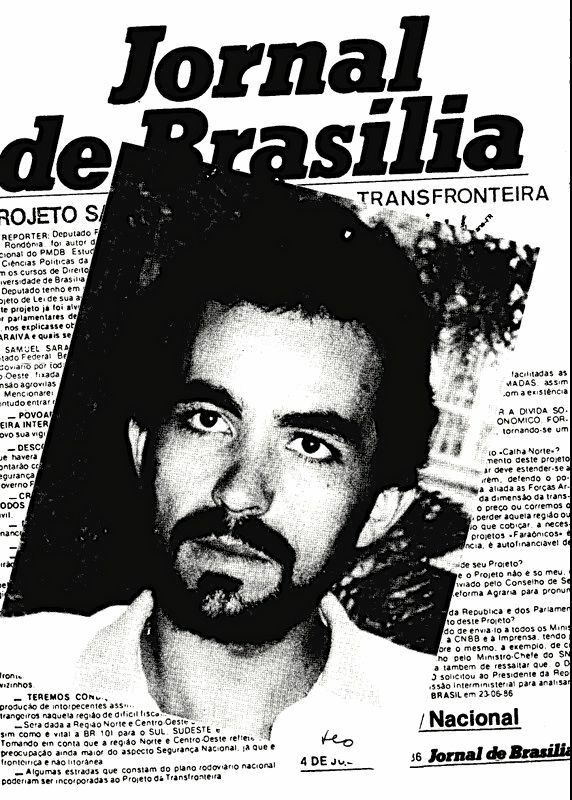 Although the path traveled by Saraiva has been permeated by the resistance of groups opposed to the ideas he defended, he was advanced for his time and never gave up the fight, driven by the irrevocable consciousness of accomplishment of these objectives. In fact, his proposal called 'Transfontera' was four times the target of boycotts and regulatory maneuvers, which prevented the proper consideration of its merit in the Plenum of the two Houses of the Brazilian Parliament. That disappointment prompted him to emigrate to the United States in the early 1990s. In addition, although far from his homeland, Saraiva did not turn to his countrymen. As a journalist, he incessantly warned the federal authorities and population through his published articles on the website "Gente de Opinión," about the dangers of that vast, desolate, vulnerable border area, transforming the concept of sovereignty into an abstraction of law. 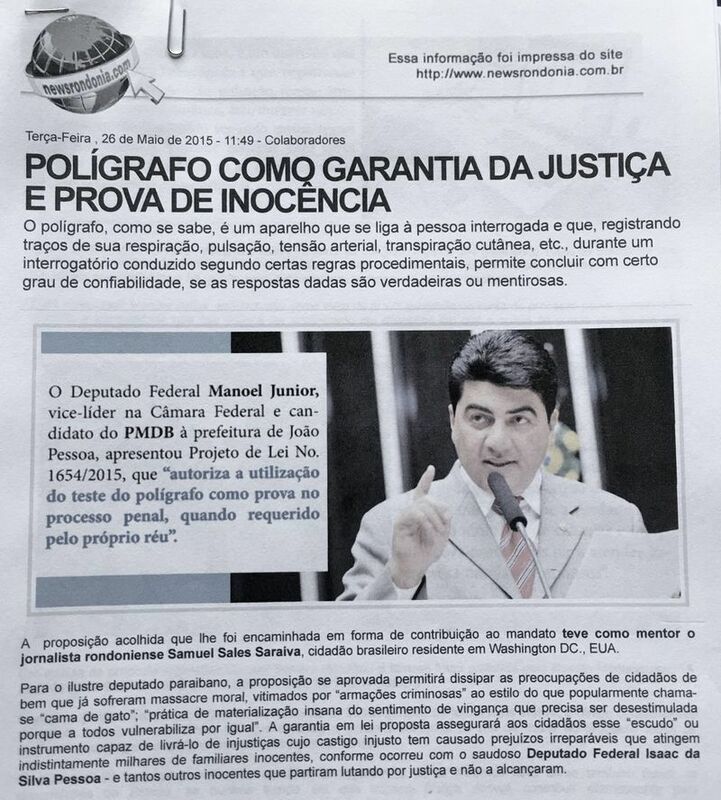 Finally, after frequent travels from the US to Brazil, using private resources, he found support in the patrioticvision of Deputy Nilton Capixaba, who introduced the "Transfontera" Project and sent it to the Presidency of the Republic of Brazil in the form of a Legislative indication, in 2013. It was accompanied by favorable technical reports of irrefutable importance, including one fromthe Army General Staff signed by Brigadier General Benedito Onofre Bezerra Leonel, and another from theMinister of Aeronautics, signed by Air Brigadier Fernando Mario Cecchi, on behalf of the Air Force GeneralStaff. In turn, the Ministry of Foreign Affairs (Itamaraty) presented the technical opinion prepared by three divisions and signed by the Minister of State, Roberto de Abreu Sodré. The recognition of merit will do justice to his remarkable dedication, pointing out that, for the legislativeact, an elective mandate is not required, a vocation only sufficing, with commitment to the exercising ofcitizenship and without demanding a single penny from the public purse, as, indeed, happens in some developed countries of the European continent. Concerning the difficulties along his trajectory to encounter the "age of reason," Samuel Saraiva was distinguished as a humanist, without admitting religion's labels, doctrines, philosophies or ideologies "- he concluded. 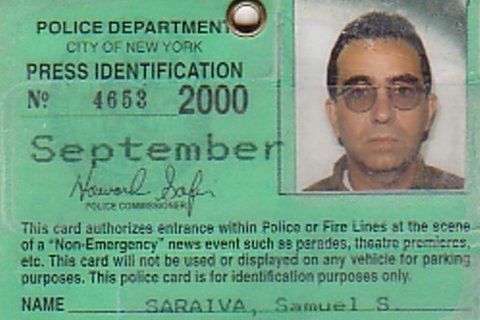 Defender of categorical denial regarding the existence of supernatural entities, and author of several articles published on the subject, Samuel Saraiva advocate in favour of free thought and scientific scepticism, where reason and evidence replace theories of belief in divinities considering them inconsistent from any rational or argumentative perspective, knowledge or direct or indirect religious feeling, be protected in the faith or in revelation. In his words: "It is not fair to prevent humanity from being developed through the correct understanding of historical events and records, re-examining ideas or perceptions about what happened thousands of years ago." The chain of transformations derived from the dynamism continues to be verified in the most diverse planes of existence. It needs to be well understood and man freed from the archaic and surrealist dogmas that imprison him in the backwardness and the format of the environment in which they were born, while only a tiny part of the population dedicated to science offers physical and mental healing through technology to those who are not heard or saved by the God who believes it exists". His biography summarizes the essence of detachment and solidarity that free him from the condition of mere passive element of history, allowing its inclusion in the select group of those who were able to understand the meaning of physical existence and its importance of the state spiritual of full freedom, necessary for the ascension of life in the permanent cycle in which we are replaced by each other, before homogenizing ourselves in the same indissoluble energy that forms the Universe. In their conception, ghosts do not exist; neither magic nor miracles are true; good and evil are relative; consciousness requires discernment. 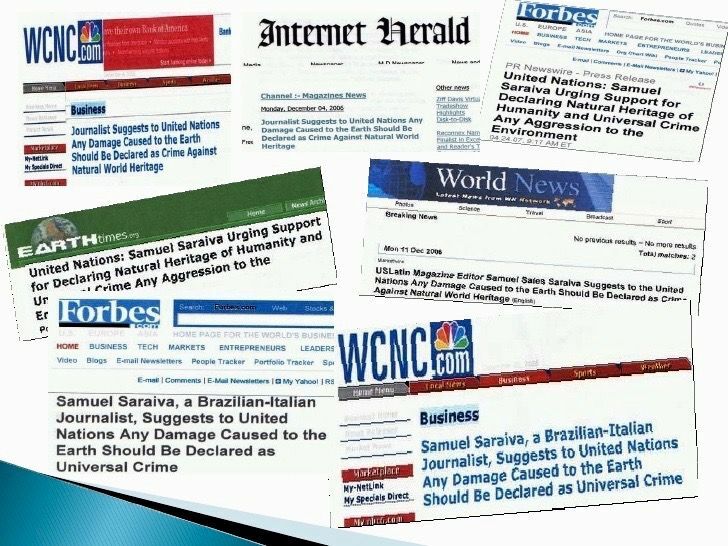 "Saraiva transcended the borders of the Amazon and Brazil to affirm himself as a citizen of the world" – a quotation from the renowned Journalist Montezuma Cruz. 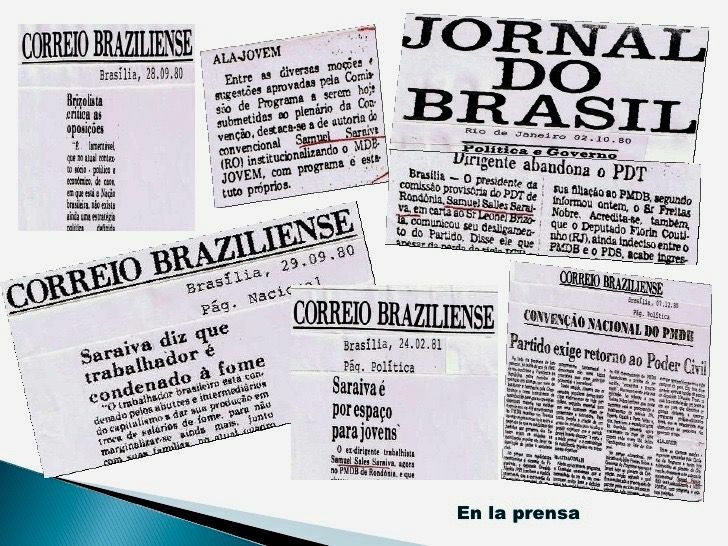 (Former editor and correspondent of the Folha de Sao Paulo, Jornal do Brasil, O Globo, O Estado de Sao Paulo and Correio Brasiliense) newspapers. Sources: Library of U.S. Congress, Media, Journal of the National Congress and National Library of Brazil.